Adventures of the Skipper and Crew of the sailboat Unsinkable 2. Sailing inland lakes and distant oceans. It's January, the lake is completely frozen over. I am slowly working through my list of winter maintenance items on the boat. The kids love going outside and climbing in the boat during the winter. And that's not easy! The boat is on the side of the house on its trailer, covered in tarps to keep the snow off. But after they climb the icy ladder and slip under the snow tarp, they enjoy helping out with the projects - climbing below to retrieve items we need, scrambling around with multimeter test leads to check various systems, crawling forward on deck to knock the snow off the tarp - it's better than Disneyland. 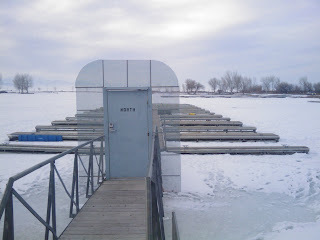 Speaking of the coming thaw, here's a look at our dock on Utah Lake - both in winter and summer. There are two docks with rentable slips, and we belong to the North Dock. One of the more peaceful memories I have is of this walk from the car down to the dock for a sailing trip. The kids are usually running ahead to the dock, and my wife and I are hauling an armload of gear and a cooler of drinks. The last few years we took a slip on the north side of north dock, but I think we'll try the south side of the dock this year. When storms come in, they usually bring strong winds from the northwest , and it is more challenging to dock the boat with the wind off our stern. The boat must have steerageway to turn (i.e. be moving fast enough that the rudder can turn the boat.) If there is a 25 knot wind pushing the boat toward the dock, I have to factor in a shifty wind in trying to enter the narrow slip. On the south side, I figure I will be heading into the prevailing wind in most conditions, which should be easier to manage. Just read through your entire blog - all of em! Thoroughly enjoyed them all - thanks for a great story. Followed your link from the catalina 25 forums.